Combine candied kumquat, candied wax melon, pork lard, flour, and duck eggs. Mix well, Wrap in tofu skin and roll into long rolls. Steam and cut into diamond shape. Deep fry until golden and crispy. Zaobing cake and mashed taro can be served as sweet desserts. 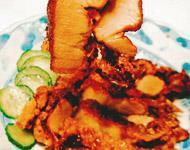 Specially selected prime Wuhua pork (pork tenderloin featuring a fatty middle) is marinated in Hongzao sauce. This dish is especially tasty when consumed with garlic. 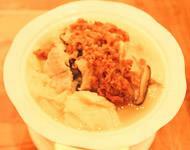 Silu Pork is actually a kind of mixed thick soup. The main ingredients of this dish include: pork strips, Chinese cabbage, diced mushroom, carrot, fried eggs, and corn starch. Place the Chinese cabbage at the bottom of a shallow bowl, top with fried eggs. Combine the pork strips, diced mushroom, carrot, and corn starch to make a thick soup. Pour the soup into the bowl. This is Silu Pork. Ingredients for mashed taro: peeled taros cut into big chunks, pork lard, eggs, sugar and candied kumquat. Making mashed taro: steam and mash taros. Add pork lard, egg, sugar, and candied kumquat. Steam again. 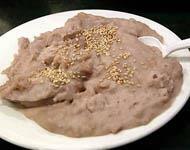 This Yilan style mashed taro is very soft and tasty. 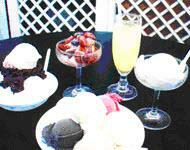 Beware of the high temperature when eating. Gaozha and mashed taro are the 2 most famous dishes in Yilan as they represent the characteristics of the Yilan people: cold on the outside and burning hot on the inside. To make Gaozha you will need: (A) chicken broth, (B) finely chopped lean pork and shrimp, (C) corn starch, and (D) chicken lard. In a saucepan combine all the ingredients. Cook over low heat for approximately 1 hour, stir occasionally. Remove from the stove and let it cool. 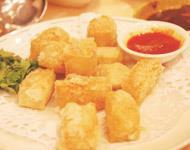 Cut into squares and deep fry until golden and crispy. 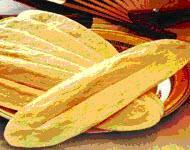 The “Ox-Tongue Cookie” is definitely the most representative delicacy of Yilan County. It gets the rather intriguing name from the tongue-like shape and has nothing to do with the animal. In the past, this thin, long pastry was used in a ritual conducted when a newborn is four months old. The cookie was hung by a string through a punched hole and worn by the infant like a necklace. Relatives and friends then used this “good-luck pendent” to wipe the infant's mouth as a way of blessing the child and hoping he or she will be gifted with intelligence. 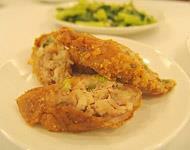 Surviving the test of time, this traditional baked good is now the pride of Yilan. Ox-tongue Cookies, to which some modern touches have been added, are now the most popular snack among visitors to Yilan. Business and leisure travelers alike are keen to bring back this local delicacy as a souvenir for friends or relatives, or simply for themselves to enjoy at home. Ox-tongue cookies come in an array of flavors for everyone to choose from, from honey, salty pepper (vegetarian), and black sugar, to milk, kumquat, seaweed and peanut butter. Benefiting from the unique nature of the local cold spring, the bean jelly from Su'ao boasts a unique chewiness. Made without any added preservative, this jelly is elegantly sweet and makes a wonderful gift as well as a tea snack. Flavors include red bean, green bean, green tea, kumquat and coffee. Red bean jelly features a solid texture with rich, whole red beans in every bite. 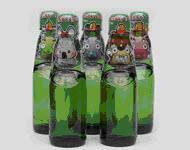 There are also the aromatic green tea and refreshing kumquat flavors to choose from. 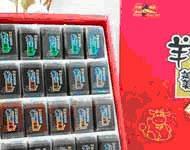 The mouth-melting chocolate jelly is the most popular option among children, while grown-ups adore the rich flavor of coffee. After a refreshing bath in the cold spring, there is nothing better than drinking a bottle of equally refreshing Ramune Marble Soda. The double cooling effect will leave you totally invigorated. Tempted? Then, stop pondering and go get one! 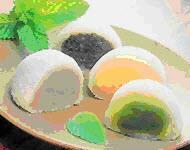 Cold Spring Mochi has a relative short history in comparison with other traditional snacks. Nonetheless, it is now a sensation. Apart from the amazing variety of fillings, its distinct texture best demonstrates the ingenuity of this creation. The outer skin is smooth and non-sticky and gently embraces a fulfilling creamy center. This is Mochi in its best form. Available at Taiwan's international airports, Cold Spring Mochi is a great gift idea if you are looking for something representing the taste of Taiwan. This kumquat concentrate captures the sweetness and sourness of Yilan's famous fruit. A cup of warming fruit tea is made easily by mixing the concentrate with hot water. Use it as a remedy for sore throats and coughs. Founded in 1931, Snow Taro-root Ice Shop has been around for almost 75 years. This family-run business has now been passed onto the third generation and held dear by the residents of Sanxing Township as part of their childhood memories. The shop has also become a local tourist attraction. Using only natural ingredients, the shop offers a wide range of ice cream flavors, including taro-root, peanut, lime, kidney bean, sesame, dragon eye fruit, prune, chocolate, passion fruit, vanilla and strawberry. Among all these products, Clear Crushed Ice has the longest history. 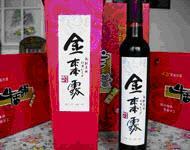 It is hugely popular for its delightful lightness in taste and in price. It is also nicknamed as the “nostalgia ice” for bringing back a familiar taste of childhood.